Trevor Pateman's Philately Blog: RSFSR 1919: Why Is This an Unusual Cover? Soviet Russian mail from 1919 is scarcer than mail from 1918 and 1920 - in this year, the RSFSR faced its biggest challenges and controlled a geographical base much smaller than it started with in October / November 1917. This cover is scarce not just because of the year, but because it is franked. At this time, ordinary private letters (first weight step) and postcards could be sent Post Free. This letter was franked to pay the registration fee and the second weight step. 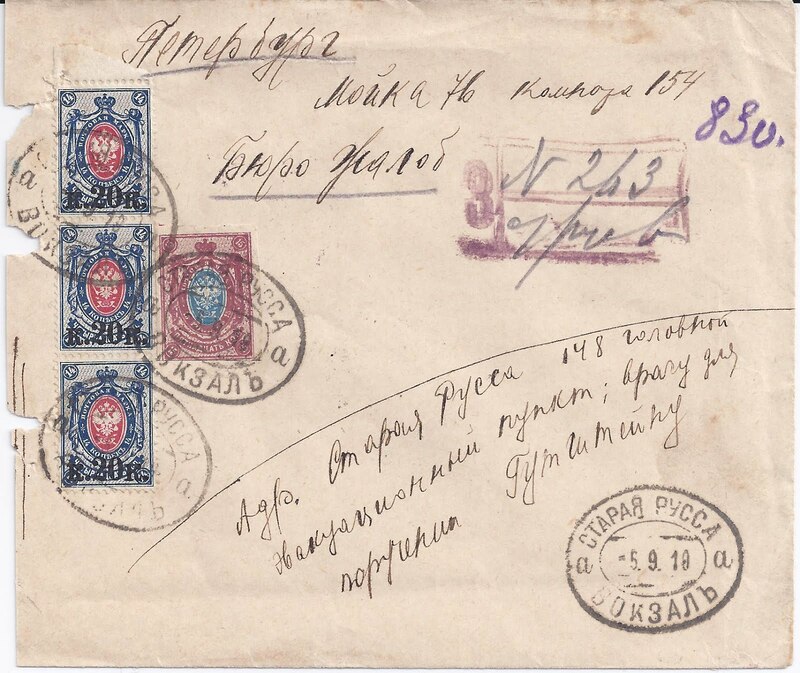 Sent from STARAYA RUSSA VOKSAL 5 9 19 to Petrograd (PETROGRAD 6 9 19 on reverse of cover), it is the kind of thing you might find in a dealer's box for $20 or 20 € or £20, but because of the date it is surely worth more even with its archival punch holes at the left. I couldn't agree more. In fact, mail franked with Arms types from various areas during 1918-1921 are the great unrecognized treasures in dealer's boxes. A friend recently showed me a 1921 Khabarovsk cover franked with Arms types. Howling rarity! Personally, I tend to scan dealer's boxes and look for rates: if I don't recognize the rate, it's time to do some staring at a cover. 70k and 75k frankings are like big signal flares that you've got a treasure, and of course, any 1919 cover is interesting, as you say.